One of our most frequent projects for clients is website building. Our building and hosting platform of choice is Squarespace because it is super efficient and, of course, the templates are gorgeous. The only downside of having such superior design is that it is a lot more rigid in comparison to Expression Engine or Wordpress. Recently, a client asked for a custom font on their new website, which isn't an option within the Squarespace design. Luckily our Squarespace smarty-pants Will found a hack! And it's surprisingly straight forward. Check it out... and happy website building! Step #1: Locate your font and make sure it's formatted. In order for your custom font to be displayed, it needs to be in the right formats. Many fonts you can download online already come as webfont (three separate file types that define and format font for web usage) but most are only .tff files. You need three separate font files in these formats: .tff, .eot, and .woff. If you only have one of those file types, you can use a Webfont Generator which will convert your single file into the three types you need. Just download the files and put them into a folder. Step #2: Upload the font files to Squarespace. In Squarespace, go to the page you want to modify. Click through Design > Custom CSS. At the bottom of the code injection window, there is a button that reads "Manage Custom Files". Click that button and upload the 3 font files. Copy the following code and paste it into the code injection window. Make sure to replace FONTNAME with the name of the font as it is labeled. Leave the quotes. Remove FONTURL and replace it by clicking on the filetype in the Manage Custom Files window. Make sure you remove the "http:" before each url. The next part is tricky as the name for different parts of the website vary from template to template. The code below should replace all the text font across the entire website. The first part of code changes the navigation and page content text to your font. The second part changes the tag line under the site header. You can also change specific header fonts by replacing the asterisk* with "h1" for heading 1 and so on. As I mentioned before, names for different parts of the website vary based on the template. So, if any of the code above fails to change anything, you might have to look up the correct names on Squarespace's support site. After you've put the code in correctly, your custom font should now be displayed across the site. Oniracom brings Storywall to Jack Johnson's Summer Tour! 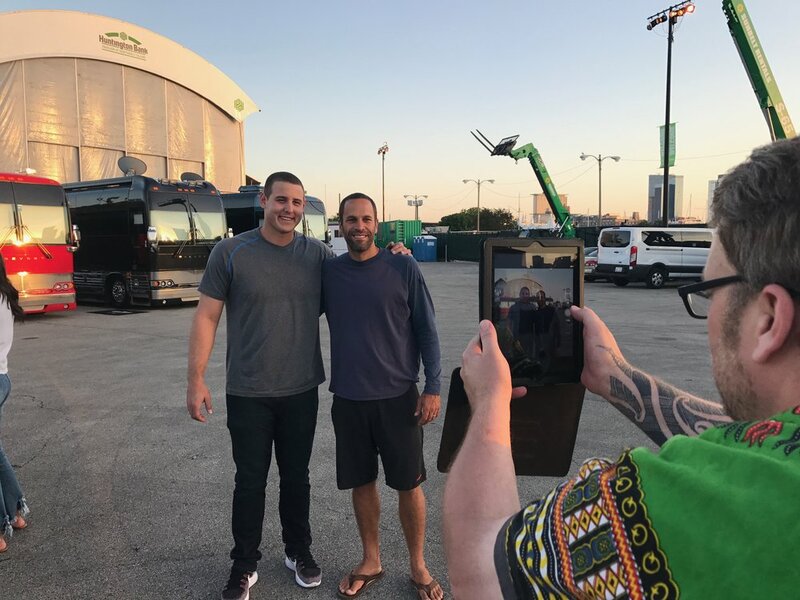 Earlier this month, Sean (CTO), Jacob (CEO) and Mike (CMO) went to Chicago to help Jack Johnson kick off his Summer 2017 tour. With them they brought our awesome Storywall technology to be displayed at all of his events throughout the summer. Storywall is Oniracom's in-house developed audience engagement tool that connects event goers to everything going on around them. It allows event organizers to display messages, run promotions, and connect with the attendees via live Twitter and Instagram feeds. During Jack's tour, his Storywall will be displaying photos of his non-profit partners that are local to each city. After over a decade of working with Jack and his team, we are still completely inspired by all the passion, talent and goodwill he puts into the world. Since Oniracom's inception, a major part of our practice as a company is being environmentally friendly. As a result, we are big supporters of Earth Day and several other sustainability projects. This weekend marks our 7th Santa Barbara Earth Day collaboration with the Community Environmental Council. For many companies the cost of going green can put some places out of business, but as more businesses join the movement, it is becoming easier. The market for environmentally friendly products has skyrocketed over the last decade. Consumers have become much more aware of their negative impact on nature and are choosing sustainable products more often every day. At Oniracom, we strive to be as environmentally conscious and sustainable as possible. We reduce our use of plastics by utilizing water bottles and tote bags. We encourage each other to walk or bike to places close by as well as carpooling to further locations. Ultimately, we all benefit from the peace of mind we experience by doing our part in improving and preserving our environment. Oniracom Presents a new logo for Data Hardware Depot! Our in-house lead designer, Keir DuBois recently helped upgrade and refresh the color scheme and design for Data Hardware Depot's logo. They decided to move away from using their full company name by shortening it to DHD. They wanted to make the letters green with the "H" standing out to emphasize their focus on hardware products, and tie in their environmental connections with color. Ping pong paddle branded with DHD's newly designed logo. DHD provides refurbished communications network infrastructure equipment, as well as a suite of Professional Services to manage all of your forward and reverse logistics, asset recovery projects, and de-installation needs. From March 10th through 12th the Traffic & Conversion Summit in San Diego brings together some of the brightest minds in marketing to discuss the current and future landscape. Our very own Jacob Tell and Mike Wald attended the event to discuss the latest strategies and techniques for the ever-changing world of marketing. Our team went as guests of our client ListenTrust, an omni-channel contact and call center. Carlos Angel (General Manager of Uber) discusses marketing tactics. The summit consisted of talks by successful movers and shakers in marketing. In particular, the team attended a talk given by Carlos Angel, the General Manager of Uber. The presentation discussed progressive agile project management, which is essentially leveraging analytics to constantly update business tactics. We got to connect with many of our platform partners as well as our good friends over at Ontraport. Overall it was a fun, interesting, and productive event for team Oniracom that we hope to attend again in the future. With several states recently legalizing cannabis and several more slated to do the same next election season, the cannabis industry is imminent. Colorado already has a thriving cannabis market with several brands emerging as the cannabis power vacuum expands. This is a great talk, not just for cannabis enthusiasts and businessmen, but for anyone interested in the future of marketing within the emerging and growing cannabis industry. Tensions are quickly growing between state and federal lawmakers regarding cannabis, so knowing how to market it without getting into trouble with the law is valuable. Anyone either in the cannabis industry or looking to enter should not skip this panel. Virtual Reality is here and has a lot of potential. It has the ability to transport anyone anywhere imaginable. If this technology is going to be widely used, it would be a good idea to figure out exactly how it affects us as thinking biological beings. Some suppose that a VR experience could produce similar phenomenon to psychedelics in the brain. This implies that you could use VR as a way to broaden perspective and produce empathy. It could potentially be used to make the world a better place by giving people a broader life experience. People will be able to experience another person’s struggles and joys in another part of the world without leaving their house. With this in mind, it will be very important to know how this technology affects the human brain moving forward so that technology can be developed with effective results. Anyone looking to do any work inside the rapidly growing VR industry should mark this panel on their calendar. Driverless cars are here… well sort of. Since Google and Tesla threw their hats into the ring driverless cars have become a hot topic. Driverless cars promise a future of safer, less congested roads and lower pollution. They were once the musings of sci-fi nerds but, now they are closer to reality than ever before. This panel seeks to clarify the potential problems this new technology will face and what its inclusion means for us as a society and individuals. Every day Artificial Intelligence becomes more and more a part of our lives. From product recommendations to driving our cars for us, we seem to be on a path that lends itself to delegating much of our decision making to AI. Amazon’s “Dash Button” is only the beginning, as shopping bots that will make your purchases for you are currently being developed. The utilization of shopping bots brings a new list of challenges for marketers. They will no longer have to market directly to the consumer, but to the shopping bots who make their purchases for them. This panel seeks to clarify what marketers will have to do in order to effectively sell to AI consumers and what it means for businesses going forward. Even with social media now a part of our daily lives we still crave connection offline. As people have always done, we bond over meals. Now that we have the ability to share pictures of our food, it has become a driving force for offline social interaction. Someone sees a picture of an amazing dish their friend ate at a local restaurant and now they want to gather their friends and try the same dish. This panel is ultimately a discussion of how online interaction fuels our offline behavior and how food has become a bastion for influencing social interactions. 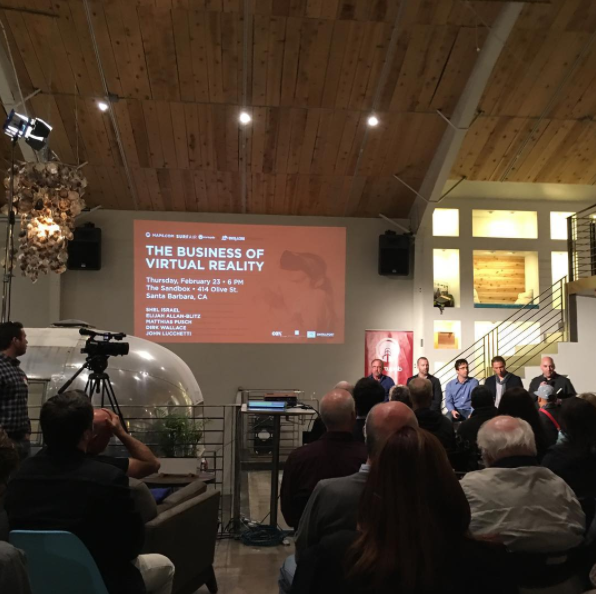 StartupSB and Oniracom collaborated last Friday night on an evening panel to discuss "The Business of Virtual Reality" with Industry Insiders. The panel was moderated by Oniracom’s own Vice President of Client Partnerships, John Lucchetti, who brought together an experienced panel that included experts in all facets of the Virtual Reality industry. The turnout was great as business professionals gathered to discuss the growing virtual reality industry and what it means for business. The Sandbox Santa Barbara served as the venue for this special event. The space is a new co-working, collaborative workspace and event venue located in our neighborhood - The Lagoon District. The Sandbox is also home to the entrepreneurial and creative community of Santa Barbara and is run by StartupSB. Panelists (From left to right): Shel Israel, Dirk Wallace, Matthias Pusch, Elijah Allan-Blitz and John Lucchetti. The panelists included Shel Israel, the author of “The Fourth Transformation” which tackles the future of technology as it relates to Virtual Reality and Augmented Reality. Israel talked about the cultural implications of Virtual Reality technology and how it will become part of our everyday lives. Elijah Allan-Blitz represented the creative side of Virtual Reality with accolades that include winning awards for his work in Virtual Reality at CES (Consumer Electronics Show). One of his main points during the evening was the concept of VR being the ultimate empathy machine. A possible avenue toward broadening perspectives by allowing people to have experiences they otherwise wouldn’t have in their daily lives. Dirk Wallace also comes from a creative perspective, having directed several Virtual Reality projects including Virtual Reality concerts and Virtual Reality episodes of Conan O’Brien. He has even taught a Master Class course on Directing in Virtual Reality. Wallace brought a special camera for recording VR experiences with him to explain how several recorded angles are spliced together to create a 360 degree image. He also explained how this recording technology can be used to capture almost any live event in Virtual Reality. The prospect is that one day, people with Virtual Reality equipment will regularly attend live streaming concerts and other events from their homes. Matthias Pusch rounds out the panel as he contributed a VR developer’s perspective. He is the Co-Founder of the Santa Barbara-based WorldViz Virtual Reality company. He has 16 years of experience in VR engineering, marketing and sales. As someone who is on the frontlines of Virtual Reality development, his input focused on the capabilities of VR along with what’s currently being developed. It was an informative night that also included a live Virtual Reality demonstration from WorldViz. The demo was a two-person setup that placed both participants in the same virtual space. The virtual space is a sandbox that allowed users to interact with virtual objects and paint on virtual surfaces. Another part of the experience WorldViz offered involved being dropped into a virtual hole to simulate the sensation of suddenly falling. The demo caps off a complete experience that not only granted attendees industry insider perspectives, but also hands-on Virtual Reality interaction. You could even say that the panel itself, was an empathy machine. Oniracom was proud to roll out the red carpet and then some for longtime client and friend Jack Johnson during his official 2017 Summer Tour announcement. We built the new landing page on JackJohnsonMusic.com. Our web programmers worked with SongKick to launch the tour pre-sale. As a digital marketing agency and web solutions team, we have supported the singer-songwriter, documentary filmmaker and former professional surfer on the web and in concert arena's for the past 16 years. Jack Johnson recently completed scoring the music for the documentary film, The Smog of the Sea. Jack was also responsible for cinematography and producing the 30 minute short that chronicles a 1-week journey through the remote waters of the Sargasso Sea. Jack Johnson sailed along with Marine scientist Marcus Eriksen joined by anunusual crew to help Marcus study the sea: renowned surfers Keith & Dan Malloy, spearfisher woman Kimi Werner, and bodysurfer Mark Cunningham. The team are on a mission to assess the fate of plastics in the world’s oceans. Our web team built The Smog of the Sea website. The track "Fragments" featured in the film, premiered recently on Rollingstone.com. Fans who purchase tickets to Jack Johnson's Summer Tour will receive a download of the new song, which is also available for purchase or streaming on all music services on February 17th. Oniracom collaborated with the Johnson Ohana Charitable Foundation to get all of the non profit partners into each Tour Detail page (on Jack's website) and on the All At Once website. 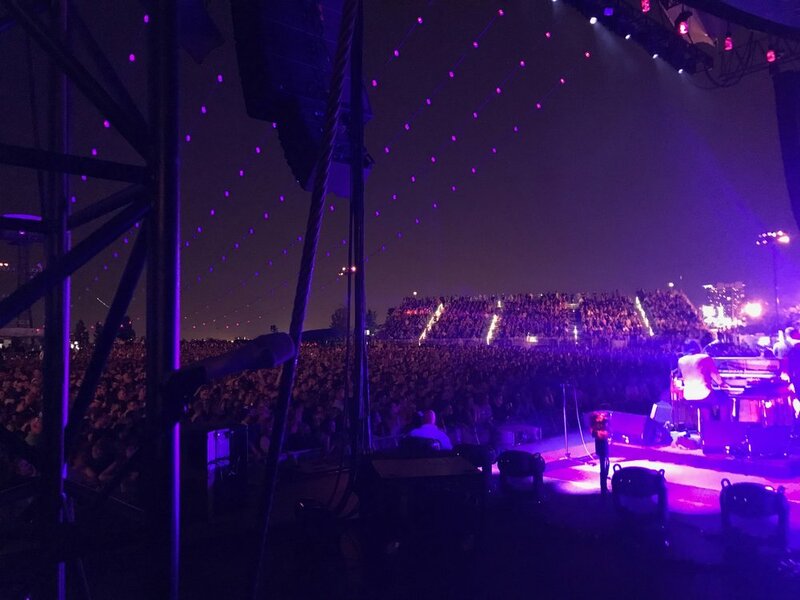 In addition to the web production we launched with these projects - Summer Tour, new Song and new Film, Oniracom also manages the Santa Barbara Bowl's outreach communications in announcing the local concerts for the 805 region. 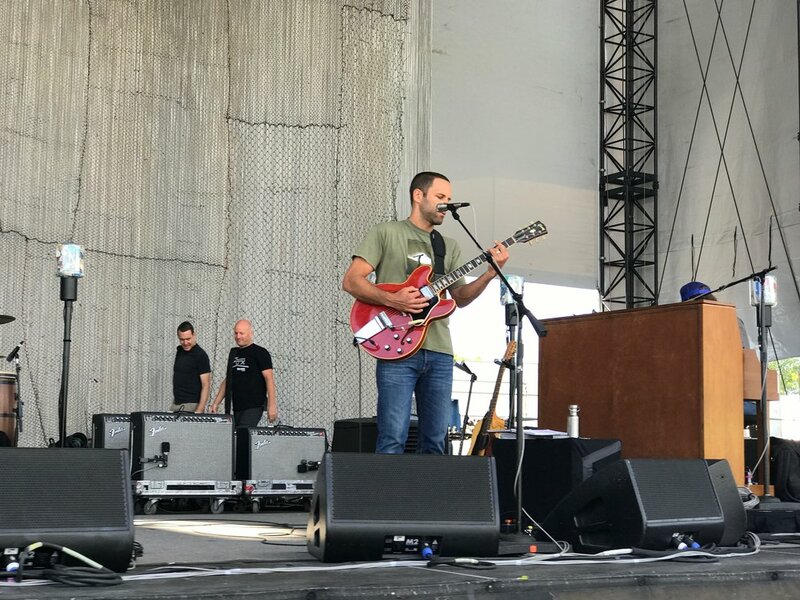 Two summer dates for Jack Johnson were added to the Bowl's website, ticket sales systems and outside sites. The tours were email blasted out to the public using branded imagery. For more information on Oniracom's web work, please visit our Music Festivals and Musicians page. 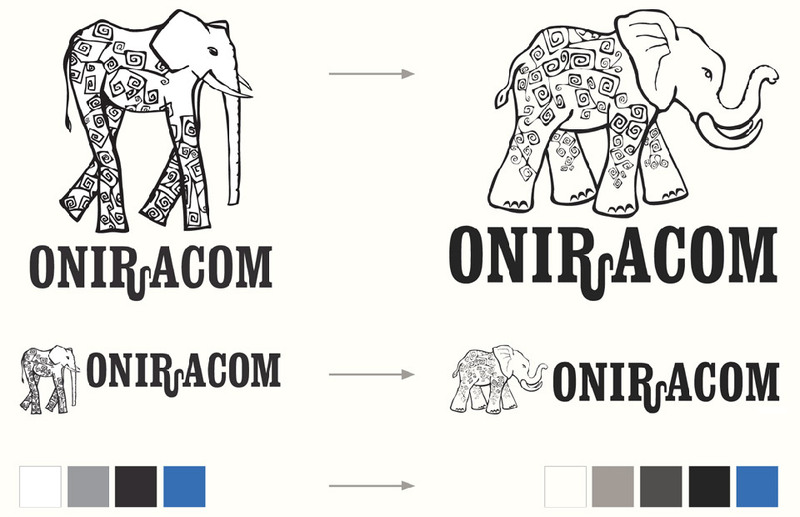 Oniracom’s new identity revision is not a radical change from its previous incarnation, but it’s more revised and organized than at any point in our 15-year history. After such long a stretch of time, something has to change or complacency creeps in, threatening future creativity. As we pivot to specific offerings for a select clientele, our identity will reflect that. Our elephant mascot has become more active and assertive, charging ahead to the next opportunity—but like all elephants it hasn’t forgotten who it is, where it came from or what makes it great and powerful. Our revised colors keep it real, moving from plain black and white (which never occur in nature) to a more subtle palette of ivory, charcoal, and shades of gray or blue. Their use changes too, becoming more subtle and allowing our work to speak for itself unencumbered by interfering identity. One thing that won’t change, though, is our wordmark. The customized “Oniracom” in Clarendon Condensed Bold is a visual link to our identity’s legacy—because we’re not forgetting the past. We’re simply defining our own future, and we’d love for you to join us there! Mondays don’t typically have the reputation for being the best day of the week, but yesterday, we had a great day! Oniracom spent all day with our new client, the Santa Barbara Bar, to do a lifestyle photo shoot in the beautiful Santa Barbara. Working with the talented photographer Lexus Gallegos, we are creating a campaign for the tasty and nutritious bars. We are excited to be working with this amazing bar brand that’s local to our hometown! Santa Barbara Bar founder, Peter Gaum has owned a wholesale bakery in Santa Barbara for 20 yeas. He created the bars as a delicious and healthy snack for friends and family, but it has turned into a local phenomenon, taking the area by storm. Not only are the bars full of flavor, but they are also gluten-free, a good source of protein and fiber, and contain no added soy protein of refined sugars. Right now there are three flavors: Coconut Almond, Peanut Chocolate Cherry, and Cranberry White Chocolate. We thank Santa Barbara Bar for stocking Oniracom full of these delicious bars, because we can’t stay out of the kitchen! Check out the Santa Barbara Bar website here to see where you can find the bars-in store (or order online). Below are some of pictures from our photo shoot, check them out! In a rapidly growing economy full of cultivating ideas and start-ups, Santa Barbara has become a main vessel for small businesses. Locally known tourist areas such as the Funk Zone and Downtown, have become popular vacation spots. With the East side of Santa Barbara seemingly forgotten, it has become a perfect opportunity for local small businesses to nestle up and command their space. The native community is small and interconnected. Businesses are known for supporting each other and word travels extremely fast.Pure Order Brewingcompany, PlayBack Recording Studio, and Oniracom are three entrepreneurial companies located in the upper side of the Funk Zone who are sparking a cultural rebirth. Oniracom has teamed up to revivify the lower East side town as, The Lagoon District. The Lagoon District historically inherited its name from its rich past. During the 1860’s, there was an effort to drain the shallow mosquito infested pools that covered the lower Eastside area. A canal in between Salispuedes and Laguna streets was dug in an effort to drain the water and uncover the fertile soil. The drainage ditch is no longer visible, but was known as “Canal Street”. In 1922 the name was changed to the current name Olive Street after olive trees were planted in the remains parts of the drainage ditch. The area between Ortega, Milpas, Haley and the Olive Streets were used for many years as a dump and disposal area. Efforts in the 1920’s to revitalize the forgotten area, led to the establishment of the well-known places such as Ortega Park and Santa Barbara High School. The culture of the area during this time was condensed in communities known to the Italians, Mexican, and even Chinese heritages who claimed their own parts of the town. Places like the 1870’s Chinatown, which was centered along the first block of East Canon Perdido, no longer remain. But, rich Chicano culture can still be seen around streets like Milpas. Eastside is home to La Casa de La Raza, the political offices of the surrounding Latino population, and the Moorish-Byzantine-Spanish County Courthouse, which is a architectural hidden treasure. Santa Barbaras Eastside is unique as it contains no apartment complexes and condominium’s that are extremely common in the surrounding city neighborhoods. There is a voted maximum population of 84,000 that keeps exclusivity and a small-town vibe, the perfect conditions for endorsing small local businesses. The district is a small area bounded by Garden, Cota, Milpas, Montecito and Anacapa streets. Within this parameter, we want to create a space for businesses to escape the overpopulated Funk Zone and uphold traditional SB values which are casual, laid-back, and more importantly, local. The benefit of this zone is an increase in business through an interconnected network of community members. Through supporting one another we can increase the Santa Barbara reputation of providing diverse brands and excellent opportunity. Without the “LA culture” of big businesses, the Lagoon District will remain eco-conscious and explorative while maintaining a local agenda. Lagoon District will showcase local companies through promotions like, the Lagoon Loop Craft Beer Trail which allows visitors to tour craft beer breweries including the legendary Telegraph Brewery. Businesses who sign up with The Lagoon District will be featured on the site map and marketed to customers and residences around the area. Events and sales that Lagoon District companies decide to promote will be illustrated in the newsletter, social media, and press. Being a part of The Lagoon District allows businesses to use B2B partnerships and discounts for collaboration. Partners can build relationships with other business owners while sharing relevant techniques and strategies. Current members of the Lagoon District include Potek Winery , Apeel Sciences , Santa Barbara Bar , Suissly Furniture, Deux Bakery , Pelago Web Design , and SB Training facility. The diversity of members is increasing as the Lagoon District solidifies into the new web of community supported businesses, offering services guaranteed to support the larger Santa Barbara community. Sign up now to become a member of the fest growing area as we aim to appeal those who think locally to grow our inclusive community. We’ve finally done it. Each staff member chose their favorite apps that they can’t live without. Take a look at who chose what, and click on each app to see why they rock! YouTube, Facebook, Tumblr and Pinterest… you know, for being stuck in waiting rooms and planning weddings.